Ness wants you to donate! Between Child's Play and The Speed Gamers, gamers have raised quite a bit of money for charities. This weekend, that trend continues with one of Nintendo's most acclaimed (and desired) series' at the center. 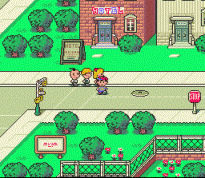 Starting at 6 p.m. CST on May 15th and going for 72 hours, The Speed Gamers will play through Mother, Earthbound and Mother 3 over a live webcam broadcast in order to raise money for breast cancer nonprofit Susan G. Komen. The Gamers expect to finish the series well under the allotted 72-hour time frame, and if they do, they will begin Earthbound anew. During the marathon, the Gamers will compile Susan G. Komen- and Mother-themed fan art to create a PDF booklet to be posted on their Web site, and a limited number of physical copies will be given away as prizes. Be sure to mark your calendars for this weekend, because causes don't get much better than this! And since the first and latest entries in the Mother series have never broken out of Japan, it's a great opportunity to get a peek at what the rest of the world has been missing. You won't have to resort to piracy either! I think they did this with the Zelda series a while back. I'll be watching Mother 1 if I can. It's an interesting game, but it's way too hard for me to want to play through multiple times. I beat it once, and that's enough. Even with the Easy hack I have trouble at Magicant. I'll try to catch some of it. I tried part of MOther 3 and it wasn't as great (gameplaywise) as I had hoped so I no longer have the huge enthusiasm of begging for these games. Isn't this the 2nd time they've done the Mother series? If so, oh well! Oh yeah! This site did a Zelda marathon a few months back! Though didn't they already do a Mother marathon? @Objection_Blaster: How far did you get? If you made it through the beginning chapter, and didn't want to go on, you must have a cold, cold, heart. Keep going. It's amazing. What do you not like about the gameplay? For me, in order to play an RPG, it has to have something special about the turn based battles, or I'll get bored. Mother 3, has that awesome health rolling feature, that gives it much less of a turn based feel. And the fact that you can be hit with an attack that would kill you, but heal before your health rolls down, is really awesome, IMO.